Hi! I’m the Chief Optimizer at RV Rhodes. For two decades, we’ve provided strategic solutions and simple tools to help employers achieve their workforce goals. Need an engaging speaker who generously shares simple, actionable tools? Then look no further. I welcome the opportunity to work with you, your team, or your audience. In all my work, I weave together real-life stories, survey and assessment data, best practices in our field, practical how-to’s and a splash of humor. Focusing on creating collaborative workplaces and amazing leaders, my goal is to deliver simple solutions to achieve your goals. 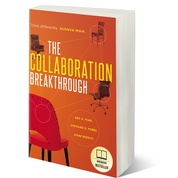 Buy My Book: The Collaboration Breakthrough and get 2 free gifts! Click the photo to purchase my book and to learn more about The Collaboration Breakthrough.